Well you can try to remake SMB2! This is sure an loyal SNES styled remake! MY EYES ARE ENJOYING THIS!!!!! A very faithful replica! Nice job. A new version is being worked on that changes every graphic on the game, stay tuned for a update! Nice game, but do you want next remake games? Did a quick warp zone playthrough. Gotta say, it's kinda surreal how there's now two full carbon copies of Super Mario Bros. on the site. I like the faithfulness of this one. Although I feel like it's a taaaaad floaty, the control is great and the game plays exactly like anyone could expect Super Mario Bros. to. 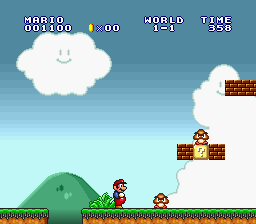 I also appreciate the subtle changes to detail like World 8 having a rainy overworld. That said, it *is* Super Mario Bros. No-frills, standard, vanilla Super Mario Bros. It's not a knock at the effort of course. It just might not be an eye-catcher considering the kinds of originality and/or twists people like to strive for in fangames.